Italian Motorcycle Marque, Ducati unveiled the 1299 Panigale R ‘Final Edition’. Why final edition? Because Ducati is moving away from the L-Twin engine design for the 1299 Panigale. In the future, we will see a V4 engine instead of the iconic L-Twin engine in the Panigale line-up. CEO of Ducati, Claudio Domenicali did the honours to take the cover off the Final Edition Panigale R that features the new tri-colour livery that is inspired from the Italian flag. Ducati’s WSBK racers Chaz Davies and Marco Melandri were also present during the event. 1299 Panigale is powered by a 1285cc L-Twin engine that pumps out 209 PS of power at 11,000 rpm and a torque of 142 Nm at 9,000 rpm. When first launched, the Panigale came to limelight especially for its unique monocoque aluminium chassis will 1299 Panigale also has. Mounted on the chassis is Ohlins NIX30 43mm fully adjustable front forks and Ohlins TTX36 rear monoshock. The braking system comprises of dual 330mm discs at the front with Brembo four-pot Monobloc callipers and 245mm single disc at the rear with Brembo dual piston calliper. Ducati CEO, Claudio Domenicali, said, “I’m incredibly proud to present this latest version of our Panigale. 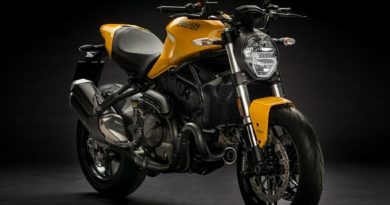 Maybe no other motorcycle manufacturer has bound its name so tightly to an engine as Ducati has to its sports twin-cylinder. Today, we’re here to celebrate its history, just as we stand on the cusp of a new era in which our desmodromic system will be used on a new generation of V4 engines derived from extensive experience in MotoGP, a championship in which our engine has demonstrated outstanding performance. But that’s the future. 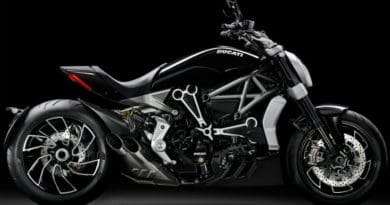 Today, we want to pay homage to a twin-cylinder engine that – thanks to incredible torque and compactness – has seen Ducati win races in every SBK championship it has ever participated in. In short, it’s the engine that has written World Superbike history. From Marco Lucchinelli’s first victory on 3rd April 1988 with the 851 at Donington Park (in the first-ever world championship for modified production models) to the stunning 2017 wins by Chaz Davies and Marco Melandri on the Panigale R, Ducati has won no less than 333 races and taken 17 Constructors’ titles and 14 Rider’s titles”. The 1299 Panigale is tricked out with electronic rider aids like cornering ABS, 6-axis IMU (Inertial Measuring Unit), Wheelie control, Traction control, Engine brake control, Ducati Power launch, quick shifter, Ducati data analyser, and Ducati Slide control. All this should be enough to make one feel like Superman on the Racetrack. The 1299 R being the track focussed model comes with lighter lithium-ion battery, forged Marchesini wheels, auxiliary adjustment buttons, Akrapovic exhaust, and titanium connecting rods and valves. Siddharth has always been passionate about Cars and Bikes. He was the kind of kid that always had the latest Auto magazine in his school bag. He had this dream- to become a professional racecar driver. Finally, in 2012 he found himself racing as a rookie driver in the Polo R Cup national racing championship. Over time he had to readjust the sail and get into automotive journalism to continue enjoying machines on wheels. Legacy of Yamaha RX 100; Is it Coming Back? How to become a Car Designer? How Long does Car Batteries Last? How to Remove Tint from Car Windows?